Art and drafting tables take a lot more abuse than regular classroom tables, so you need a tabletop that will still look good despite the wear and tear. Look for a tabletop with a sealer and lacquer finish to keep paints and other mediums from staining the worksurface. Plastic laminate tabletops are standard on many art and drafting tables. These tabletops cost less than resin tops, but are not as durable. Fiberesin tabletops are extremely durable and a good choice for most art and drafting classrooms. The surface is made up of layers of melamine. The tabletop is exposed to a heating process that melds the layers to a high-quality particleboard; this means that your students can't pick the layers apart or damage the table. Epoxy resin tabletops cost quite a bit more than other tabletops, but are also much more durable. Like fiberesin, epoxy resin is made through a heating process. 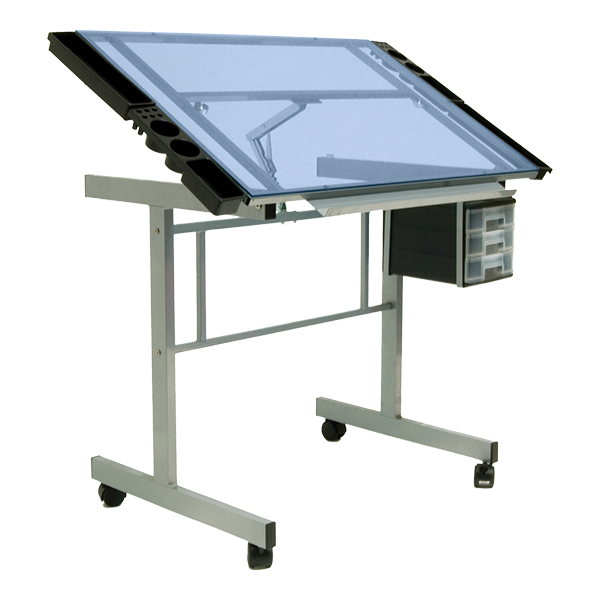 The result is an incredibly durable tabletop that resists most chemicals, heat and water. Sold hardwood tablestops will withstand years of heavy use and add a classic look to your art room or studio. They're generally more expensive than plastic laminate tabletops. Whether you choose metal legs or wood legs, you'll want to be sure the table is sturdy. Legs that aren't connected well to the table create a shifting worksurface, which can be a big problem when working on an art project or sketch. 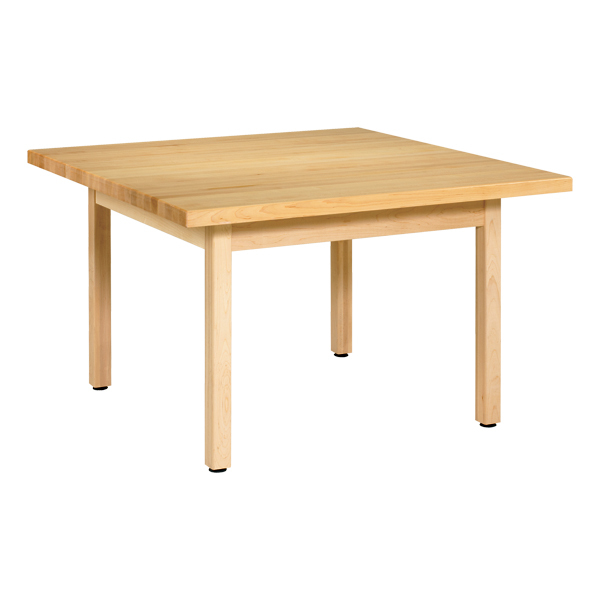 Look for mortise and tenon construction on wood tables. Many table legs are glued or simply screwed into place. Mortise and tenon construction is like a puzzle – the end of one piece of wood slides into a hole in another piece of wood. This reduces shifting and wear and tear on the leg joints. If the legs are attached with screws, check how the screws attach to the table legs (this applies to other table joints, as well). Some tables have screws that are drilled directly through one piece of wood into another. As the table is moved and weight is shifted, the wood around the screws begins to wear away. The result is a wobbly table. It's better to have metal-to-metal connections, like screws that pass through metal plates that are attached to the underside or legs of the table. Some art and drafting tables have adjustable drawing areas that make it easy to get a comfortable angle for working. Check for convenient features like surfaces that lock into place, storage ledges and pencil rails. Most art and drafting tables have anywhere from one to four drawing areas. A table with multiple drawing areas is a good choice for a small classroom. Art and drafting tables may have fixed or adjustable height. Fixed-Height tables cannot be adjusted in height and the adult-sized models are usually about 29 to 30 inches from the ground. Adjustable-Height art and drafting tables can be moved up and down to accommodate people of different sizes, ages and physical abilities. Check product specifications for the exact height range. Click here to check out all of our art and drafting tables. Or, give our friendly sales team a call at 1-800-260-2776 for more information.